Successful batch after two attempts! Preface: I am not an experienced baker. I love to cook and experiment with ingredients, but I am an amateur. I do not have a kitchen equipped with all the fancy equipment needed to really impress a crowd. I don't have a stand mixer or frosting piping bag with special tips. So, keep in mind that I am working with just the basic tools and equipment. I used a simple handheld mixer with beaters rather than a stand mixer (an immersion blender didn't work for me) and a big ziplock bag for piping the cookies onto the sheets. I used just basic stainless steel and glass bowls. I didn't have cream of tarter or parchment stocked in my pantry so I made due with substitutes. 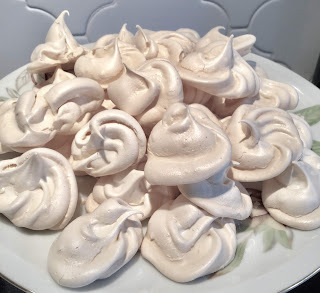 So.... with 4 basic ingredients: eggs, sugar, vinegar and vanilla and armed with a ton of ambition, creativity and a mind for experimentation and adventure, here are my trials and tribulations tackling a nemesis known as "meringue". 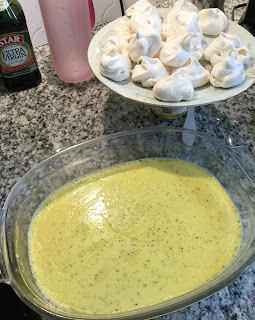 Years ago, when we lived in Colorado, I tried to make meringue and was completely unsuccessful. I attributed it to the high-altitude and resigned myself to store bought meringue. I figured this was a battle that I’d never win so why waste the ingredients. Now, almost two decades later, on a blustery winter day on the East Coast, I was suddenly up for the challenge. Too cold and miserable to be outside, I thought that the day might avail itself perfectly for a baking challenge. The air was dry. Perfect, I thought, because it is recommended to bake meringue on low humidity days. 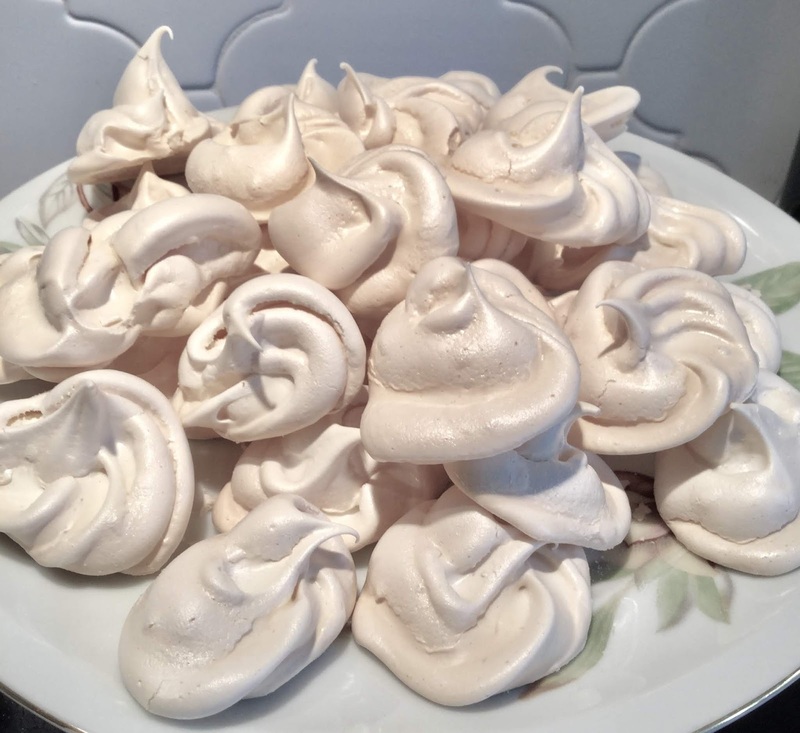 With meringue essentially being a whipped sugar and egg white cookie, the sugar acts as a humectant and draws moisture to the cookie’s surface. So, if baked in a high humidity environment the cookies can become more like marshmallow....sticky and limp. Not ideal for the wonderful lightweight crispy deliciousness that makes the perfect meringue! Everything started off looking great. The egg whites frothed perfectly. I had a beautiful snow white shiny smooth icing after adding the first teaspoons of sugar. It was getting there, but it wasn’t forming any peaks. I blended for 10-15 minutes. I added more sugar to try to stiffen the mix. Still just glossy icing. I thought that maybe the tall plastic “cup” that I usually use for the mayo was too small. So, I moved the mixture to a large stainless steel bowl using a silicone bowl scraper. I switched from the immersion blender to a hand mixer. It still looked like it had potential. Maybe if I use a little more sugar, I can stiffen it up a bit. I added more sugar and kept mixing. Nothing. Thick white icing. It looked like the glaze you’d put on cinnamon rolls. After 15-20 minutes I gave up. I put the failed attempt aside and decided what I’d do with the 4 egg yolks I had separated from Trial #1. Crème Brûlée is a family favorite. So, let’s do that! But, for my Crème Brûlée recipe, I needed 7 egg yolks. So, I set my sights on meringue.... one.... more.... time. 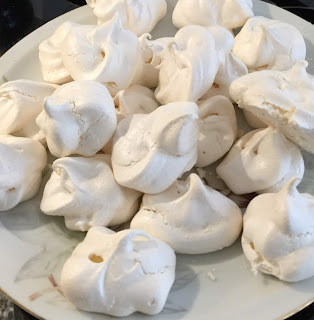 My neighbor makes meringue cookies each year for a neighborhood cookie exchange. I remembered what she said to me this past Christmas. Don’t use anything plastic. Don’t have even a smidgeon of egg yolk in your egg whites. Don’t have any trace of oil, grease or water on your beaters or equipment. Okay. I can do this! My eggs were already at room temperature as they were left out during failed attempt #1. (Note that room temperature eggs fluff up better.) I thoroughly cleaned and dried the large stainless steel bowls and beaters. I separated the eggs very carefully making sure that only egg whites fell into the bowl. In an abundance of caution, I used one small glass bowl as an intermediary. That way, if any yolk fell in, I’d only sacrifice one egg rather than the whole lot. In the one immaculately cleaned glass bowl, I separated one egg white. I moved this to the large immaculately cleaned stainless bowl. I did this same step with all 3 eggs. I put the yolks with the other yolks from attempt #1 to be used for the custard dish later! I added the vinegar and vanilla and beat the eggs with the hand mixer until they became frothy. I started adding the sugar slowly, one teaspoon at a time, being careful to continue mixing the mixture at the highest speed the entire time. I let the mixing go on quite awhile between each teaspoon of sugar. You want to allow time to have the sugar dissolve before adding more sugar to the mix. Otherwise, you'll weigh down the meringue and get flat cookies. The process of whipping up the egg white with the teaspoons of sugar took about 10-12 minutes. The time is takes you might differ depending on the temperature of your egg whites and the speed of your mixture. After about 7 minutes, the meringue started to get a beautiful glossy sheen to it and I could tell that the peaks would soon be arriving. I scraped down the sides of the bowl a little to move the mixture to the center. It was definitely full and fluffy but not quite "stiff peaks". So, I continued to mix until about 10 minutes. I was happy with the result. I took a spoonful, turned it upside down and nothing dropped from the spoon. That was my test. I was ready to drop these sweet delicious treats onto a cookie sheet. I didn't have any parchment paper in my pantry, so I just used non-stick cookie sheets. I also don't have frosting piping bags or tips, so I grabbed a gallon sized ziplock bag and snipped a small "v" in the tip of one corner to mimic a star-shape on the tip. I scooped the meringue into the bag and began to pipe small swirly cookies onto the cookie sheets. I was careful not to push down too hard on the meringue mixture as I was afraid I might loose the wonderful airy feature of the meringue. (I would definitely use only a piping bag for the cookie shape. I think a cookie press or stamper would be too hard on the delicate nature of these cookies. A cookie press might work if you want to meringue wafers for French macaroons, etc.) I was able to make about 30 small cookies. They don't expand much, if at all, when bake, so you don't have to worry about putting them close together. 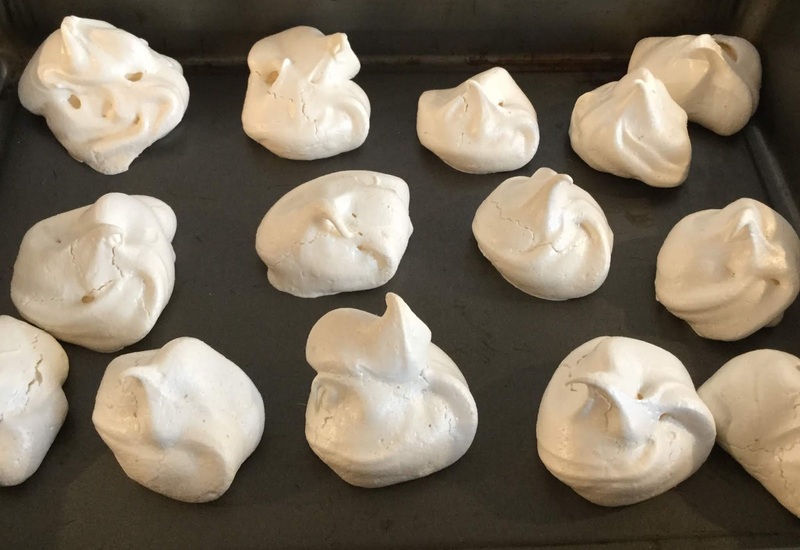 Baked Meringue: Piped with ziplock bags onto cookie sheets. Based on the fact that these looked like meringue cookies even when unbaked, I thought they'd turn out successful. They weren't flattening at all. They were staying nicely peaked and fluffy right on the cookie sheet. YAY! I moved both trays to the oven at the same time. I didn't want to risk opening the oven and causing the meringue to fall. I baked for 35 minutes at 250 degrees. I texted my neighbor....who's been successfully making meringue for years and told her to run over and grab a few and tell me what she thought. Soon after I texted her, my daughter and her friends arrived. They begin devouring the meringue. I quickly grabbed four for my neighbor and her husband before the kids inhaled everything on the plate. They didn't last long at all! I made the crème brulee with the eggs from the first two trials. So I had the perfect amount to make a decent crème brulee. The crème brulee with vanilla bean made with the eggs leftover from Meringue Trials 1 & 2. Trial #3 : Ok, but not great = Unsuccessful. 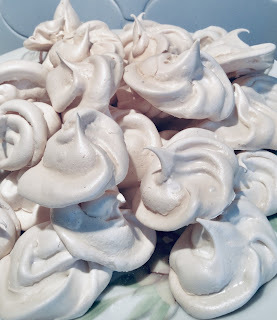 I thought I'd learned everything there is to know about meringue having successfully made an entire batch in Round 2. Well, I learned quickly that the best plan can still fail if not executed perfectly. Given that the first trays of cookies only lasted about 10 minutes. I set myself on making more. I tried this batch with half as much sugar. I wanted to make them less sweet. I also experimented with dusting the tops with different ingredients. Some were dusted with cinnamon and some were dusted with cocoa. I dusted them prior to making them. They baked fine. The mixture was fluffy the meringues were peaked and they were very tasty. The reason that I'm going to call this trial unsuccessful is because they were still sticky. My conclusion: The reason I think this batch failed was because I had used an oven that was already a little hot from having baked the crème brulee. It was at 375 for the crème brulee. I let it cool, but my oven showed it was 250, but I think it was still hotter than that when I put the meringue in. So, the outside of the meringue browned slightly. I took the meringue out when they began to brown. I think I took them out too early. They were still tacky and this stickiness drew moisture to them and caused them to become very chewy. They were edible....but not like a good crispy, melt on your tongue meringue. They were more like a gourmet marshmallow....dusted in cocoa and/or cinnamon. Good, but not great. On this batch, I made sure to have: Immaculately clean and dry equipment. Room temperature eggs. I also placed the sugar in a food processor first to grind it finer because it had a few big lumps in it. I beat the eggs, vinegar and vanilla until frothy. I added the sugar one teaspoon at a time. I continued mixing with the hand mixer letting each teaspoon of sugar dissolve fully before adding additional sugar. I touched a little of the mixture to see if it still felt grainy. I wanted it silky smooth. After about 7 minutes it was getting to look like beautiful silk fabric. Then after 10-12 minutes, stiff peaks formed in the mix. I put a little dollup on a spoon. Turned it over to see if it would fall off. It didn't! I was ready to pipe it! I prepared my makeshift piping bag using a ziplock gallon bag and notched a small "V" in the tip of the bag. I piped the meringue onto two cookies sheets in a swirly little design. Again, I didn't have parchment, but I would recommend it. I baked at 250 degrees for 35 minutes. This time, I left them in the oven as the oven cooled. The result was an entirely crispy, sweet, melt-in-your mouth crumbly delicious meringue. No chewy center. They also turned out a touch more caramel in color. Probably due to the extra heat. Because I personally like the tiny touch of chewiness in the center. I prefer my "Trial #2" attempt and will remove them from the oven after the timer goes off at 35 minutes rather than leave them in the warm oven. I hope you found this post useful. Meringue can be a tough cookie to make and I thought I'd share my trials and tribulations to help others in the kitchen who might also be tackling problems getting their meringue to work. Please feel free to comment if you have further questions or if I can help with additional information. Good luck and happy baking! March 2019 Update: I have now made these successfully several times. I did not like the texture of them when I added food coloring to the mixture. It made them a bit more tacky. My daughter and her friends love these! I also bought a few piping bags and piping tips. The star tips worked great. I tried the sultane piping tip and will need to do more practice with it. 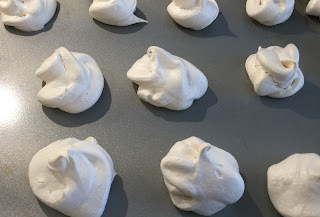 My sultane meringues weren't too impressive on rounds 1 & 2. They tasted fine, but weren't piped too evenly. I also tried to use the Russian piping tips and they definitely work better for buttercream. The meringue is just too soft to get a good shapes from the Russian flower tips. But, the Russian ball piping tips worked ok. I still find that the star tips work the best. The smooth piping tip makes adorable meringue kisses as well. For a completely different project. 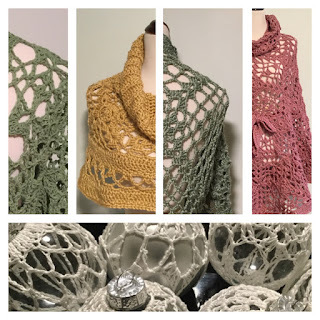 Check out my newest crochet pattern ebooks.